I am not a Tony Romo apologist. I don't think he has much to apologize for. This is a big year for him, but not because he has failed to this point. The team has not won in the playoffs, and that is a concern, but that doesn't mean they haven't received top-flight play from the QB position. There is one thing to note here. When Roger Staubach won his first playoff game, he was 29 years, 11 months old. Tony Romo is about to play his Age 29 season, and Troy Aikman had his 3rd Super Bowl won at the age of 29. Again, not trying to make the case that this is an apples to apples study. But, since 2006, only 6 quarterbacks AVERAGE a +10 TD/INT in each of the years. Exactly 3 QB's in the entire NFL have thrown 80 touchdowns during that span. And only 1 was doing it in his first 3 years as a starting Quarterback in the National Football League - Tony Romo. And this business about his being a Interception machine? Well, do you notice how many players on this list are in his neighborhood in the interception department? And did you happen to notice how many Super Bowl Rings are in that group - during this stretch? Eli? Roethlisberger? Oh, my. Who knew? And those fumbles that I am always asked about when I bring up his TD/INT? Fumbles are certainly not to be ignored. A few quick thoughts on fumbles. First, I am often asked why fumbles are not part of a QB rating and my reasoning (although I cannot verify that this is the true reason) is that Interceptions are often a conscious decision. A QB sees something and makes a throw trying to advance the ball. If he is wrong, it is picked off. A fumble, on the other hand, is not a poor decision - unless you consider trying to keep a play alive a poor decision, which is a fair counter - but rather it is often the product of poor pass protection from the line and poor ball protection by the QB. Romo and the Cowboys are guilty of both as you will see below, but it might require not more film study - it may require better protection. The other point I would make about fumbles would be that they will often be far more damaging to a team when it comes to field position. An interception is downfield, but a fumble from your QB is usually behind the line of scrimmage. That, of course, is very bad. A QB has to protect the ball, and a team has to protect its QB. Of the 11 QBs above, 9 of them fumbled at least 8 times and at most 12 times. Peyton Manning lost 2 fumbles and Kurt Warner lost 16. The other 9 were between 8-12 over 3 years. These QB's lose fumbles 3-4 times a year. All of them. Romo has too many fumbles, there is no doubt about this. And when you add his interceptions to his fumbles (46+12 = 58) you will see that he ranks as 3rd most giveaways amongst that list of top QBs. Who would be joining him on the medal stand of giveaways? Ben Roethlisberger (61) is first and Eli Manning (59) is second. Between them, they have won 3 of the last 4 Super Bowls. So, evidently, the good far outweighs the bad. How about this reality? Ask any statistical dork, and they will tell you that a "90" passer rating is the number that is often considered to define "elite" QB play. If you have a rating above 90, you are in the top 25% of QB's in the National Football League. Fewer than 10 players can say that. Only 2 names show up on all 3 of those lists. Peyton Manning and Tony Romo. Playoff wins and Super Bowl wins are what matters most. However, do they always distinguish quality QB play? For instance, in 2000, was Trent Dilfer the best QB in the NFL? In 2002, was Brad Johnson? In 2007, was Eli Manning? Of course, not. Sometimes, the only fair way to distinguish the play of a QB is to look at his measurable statistics. QB Rating and TD/INT ratio are two of the best metrics that we have to determine QB excellence. And he passes both with flying colors. 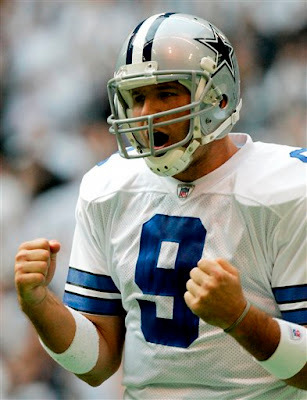 W-L record doesn't hurt either, and at 27-12, Romo's win percentage sits at 69% to date in the regular season. And, 0-2 in the playoffs. 1) He has not been that bad. In fact, he has been very good. There are many things that have happened that have been his fault, but like all QBs, he has been blamed for the sins of the defense, the coaches, the OL, the WRs, and whatever else has gone wrong in the last 3 holiday seasons. And that is the job. Fine. But, he has been at the very, very worst, one of the best 10 QBs in the entire NFL. Given that there are 32 starters in the league, when he is in the upper 30% while playing in his first 3 seasons....you may have to stop the insanity. 2) He has been playing his first 40 games in the NFL. I don't care how long he was on the sideline, very few players in the world not named Tom Brady, Kurt Warner, and now, Ben Roethlisberger find great success within 40 starts. His age is advanced for a kid, but he has been a kid. In September, he will play his first game since Eastern Illinois in 2002 that had a huddle where he is the guy in complete charge (Good luck, by the way, to Trent Edwards) and it has been a tough task to learn, he should now be ready. Romo is currently at 39 career starts. For context, Super Bowl winning Quarterbacks average 30 years of age, and 85 career starts - about 5.3 NFL seasons worth of starts. Some did it in fewer than 39 (Staubach, Montana, Warner, Brady, and Roethlisberger) and some took much, much longer (Peyton Manning 144, John Elway 219). He has been green. But, he should be nearing the end of his training. See, I didn't claim that he gets any longer. The fact is, 2009 is an extremely important year for him. I would suggest that he does need to get that first playoff victory. He does need to exhibit the ability to make the right plays and not make the wrong ones in his 3rd full year and 4th year as a starter. He is no longer a kid. They made adjustments to fit him. It is now a year for make-or-break. If he falls on his face in 2009, the Cowboys would be foolish to consider QB a position of strength. But, it appears many in the public - yes, even Dallas fans - already have ruled him "not the guy". He won't ever win the big one, right? You don't know he won't anymore than I know he will. Chances are, if you feel Romo has nothing, there is nothing I can tell you that will change your mind - only he can change your mind with some big moments after Christmas. But, perhaps some of these numbers and thoughts have made you consider what you believe about the Cowboys' QB.